Water off the Kailua-Kona, Hawaii coast is usually clear, and blue, at a depth of 10 meters. There exists in many serious hobbyists the paradoxical desire to create a natural environment via artificial means. This artificial ecosystem would mimic the composition of seawater, the water motion created by wind and tides, temperature, and of course, the intensity and spectral qualities of sunlight as it is ‘filtered’ by clear oceanic water. We occasionally read in hobbyist literature advertisements for lamps that claim to artificially replicate light quality found at certain depths on natural coral reefs. 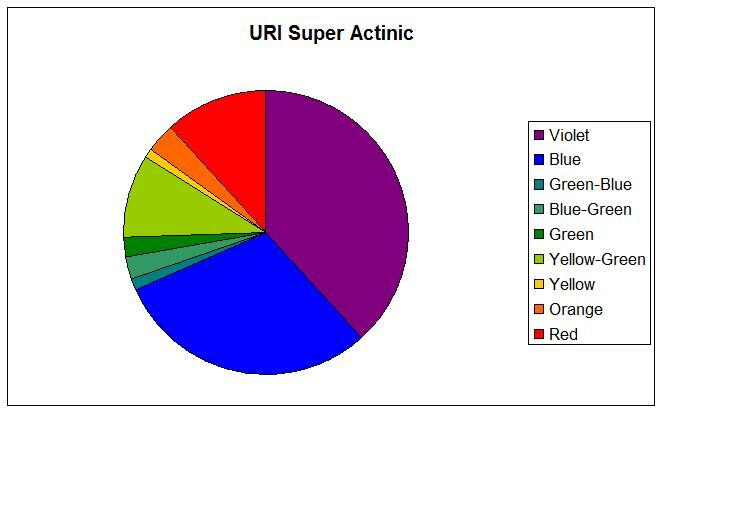 This article will examine spectral quality of various fluorescent lamps available in the US and Europe, and will compare these with various qualities of natural sunlight. 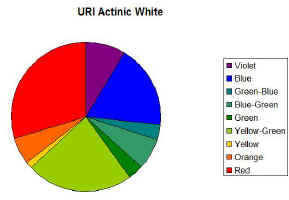 This information may be useful to those purists wishing to mimic light quality found in the most optically transparent (‘clearest’) oceanic water, such as those reef crests dominated by small-polyp stony corals. Fluorescent lamps have been a staple in the hobby for many years and occasionally new variations are introduced to the market. 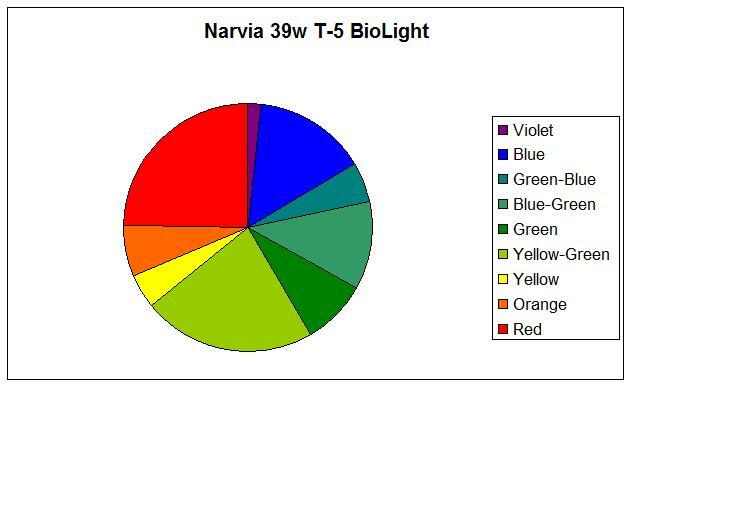 Such is the case with the recent introduction to the US market of ‘T-5’ fluorescent lamps. 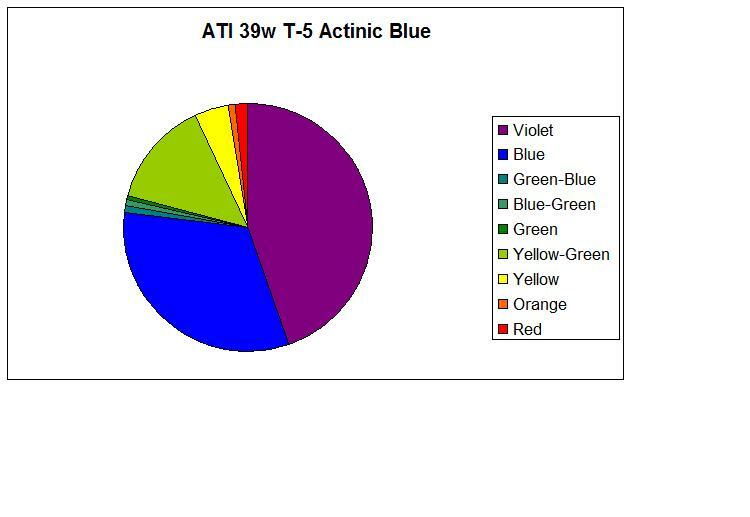 This article will examine qualities of some of the ‘newer’ T-5’s, as well as tried-and-true work-horse fluorescent lamps – especially that of spectral quality and, to a lesser degree, light intensity (photosynthetically active radiation, or PAR). 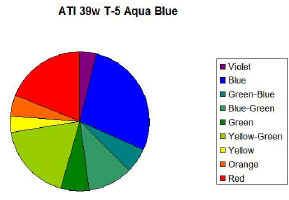 Introduced in the early 20th century, fluorescent lamps are a popular choice for lighting reef aquaria. They are available in a wide range of sizes and wattages. Wattage measures the electrical consumption of a lamp, not it's light output. 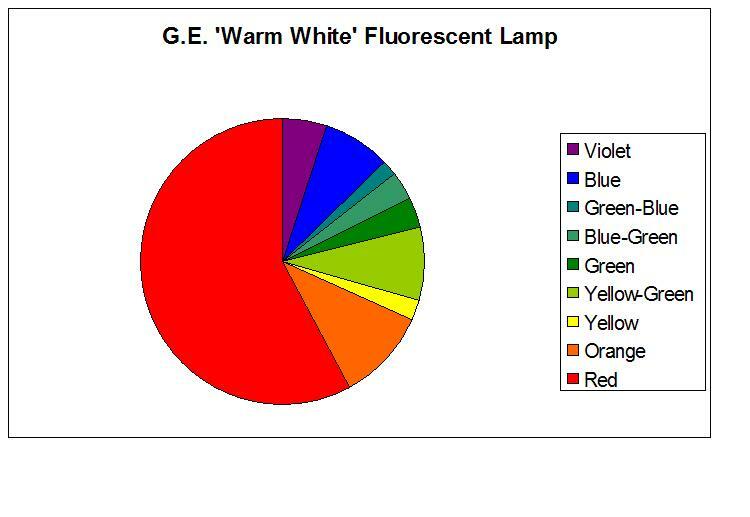 For fluorescent lamps, lumen output per watt of energy is about 2.5 to 3 times that of incandescent lamps. 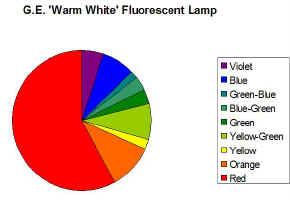 Lamp life is also generally much longer (as much as 20X that of incandescent lamp). Fluorescent lamps are tubular glass envelopes containing argon (or krypton), mercury and selected phosphors. 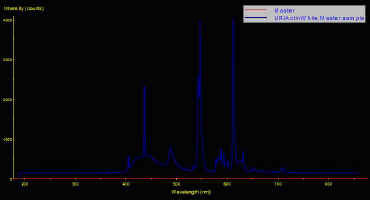 Supplying adequate current to electrodes at the ends of the tube generates an electrical arc resulting in production of invisible ultraviolet (UV) energy, which excites the phosphors. 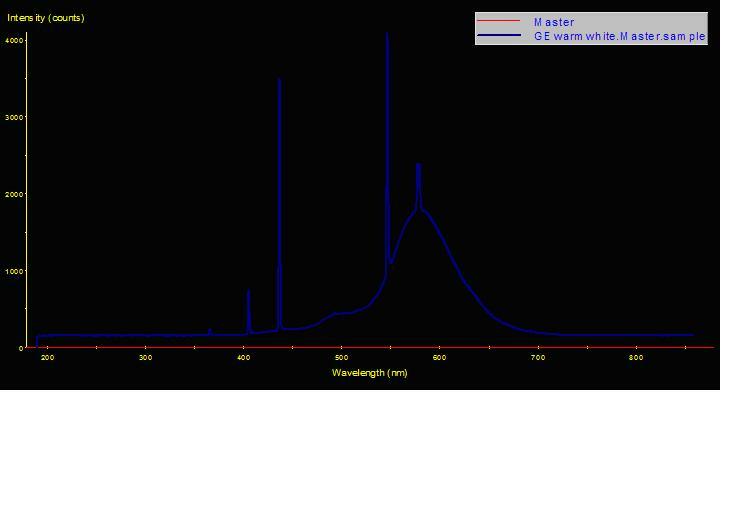 These phosphors absorb the ultraviolet energy and emit (fluoresce) it as visible light. 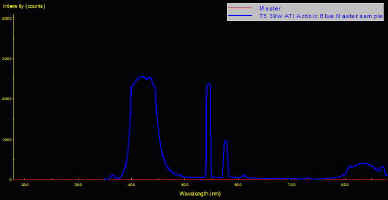 Mixtures of phosphors within fluorescent lamps produce various light qualities. 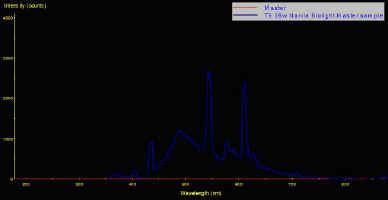 Phosphors that produce blue wavelengths include calcium tungstate and strontium chloroapatite. 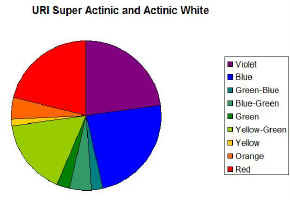 Blue-green and green are produced by barium titanium phosphate and zinc sulfate, respectively. Magnesium fluorogermanate produces red wavelengths (IES, 1984). 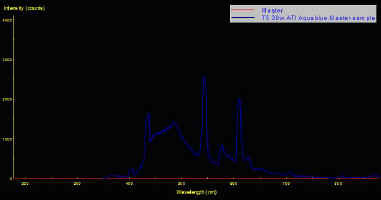 The element mercury (Hg) also lends spectral quality to the lamp’s output. Mercury produces many spectral lines - of most interest to hobbyists are those narrow spectral bands at 365 nm (UV-A), 405 nm (violet), 435 nm (blue), 547 nm (yellow-green), 577 nm (yellow-orange) and 579 nm (yellow-orange). “Triphosphor” lamps have recently appeared on the market. This formulation of phosphors enhances greens and reds. Triphosphor lamps have varying degrees of light production in the following portions of the spectrum: violet/blue, blue-green, green-yellow and orange-red. 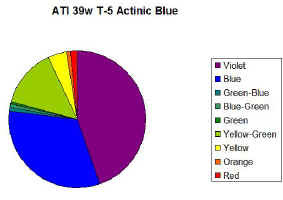 Most Compact Fluorescent lamps presently on the market are tri-phosphor lamps (except for ‘blue’ and ‘actinic’ lamps). Most fluorescent lamps are most efficient at about 25°C (77° F); however, they are designed to operate at about ~38º C (100°F). Light generation drops about 1% for every 1° C rise in temperature above 25° C. Internal pressure of the lamp is directly related to light output; pressure is sensitive to temperature. A small fan might serve too purposes – light output is potentially increased if lamps are cool and heat transfer to the aquarium water is decreased. Generally, the first marking designates the manufacturer or marketing agent. Examples include Osram, URI, Coralife, ZooMed, etc. The next marking usually indicates the type of lamp. Common markings for fluorescent lamps are “F”, “FR” for standard tubular lamps; Compact Fluorescent lamps are usually marked with “TT” or “PL,” depending upon manufacturer. These markings are followed by a number indicating wattage. Tubular lamps are marked with the diameter, usually as a “T”, followed by a number, indicating diameter in eights of an inch. “T-5” indicates a lamp of 5/8” diameter; “T8” means the lamp diameter is 8/8ths or 1”; a T12 means 12/8ths or 1.5” inches in diameter. This may be followed by ballast requirements such as “HO” or “VHO.” Lamp Kelvin Temperature may be noted as 30 (or 3,000K), 65 (6,500K) and so on. Osram/Sylvania lamps often have “D8” immediately preceding the color rating. URI is the manufacturer; FR designates this lamp as “Fluorescent”, 30 = 30 watts, T12 designates =12/8ths, or 1.5” diameter. 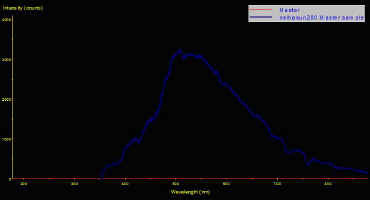 A spectrometer (Ocean Optics, model USB-2000, Dunedin, Florida) was used to evaluate sunlight and individual lamp spectral qualities. Data was down-loaded from the spectrometer into MS Excel worksheet, and analyzed with a proprietary program. 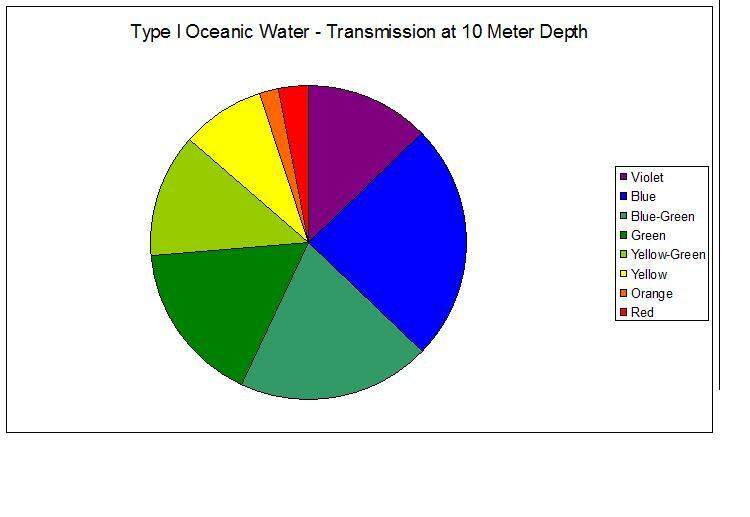 Light transmission data of Jerlov (1976) was used to estimate spectral qualities of sunlight in Oceanic Type I seawater at depths of 1 meter and 10 meters. 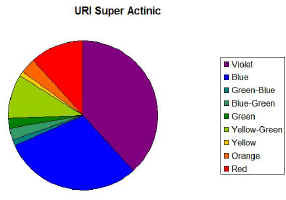 The results of testing of URI Actinic White and Super Actinic were combined by simple addition. 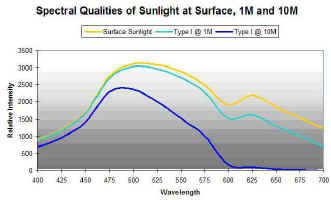 Figures 1 – 23 demonstrate spectral qualities of sunlight (surface and at-depth values) as well as lamp spectral qualities of various fluorescent lamps. Click on any diagram to open a window with a full size image. 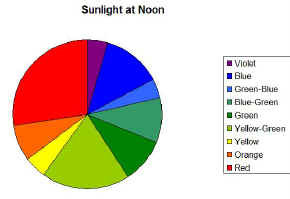 Figures 1 and 2: Sunlight at noon. 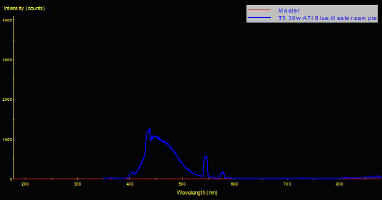 Figures 3, 4 and 5: Comparisons of Sunlight (Surface, 1 Meter and 10 Meters). 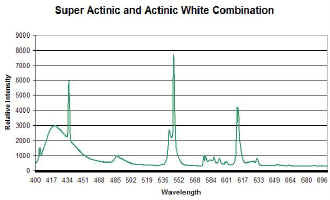 Figures 6 and 7: URI Super Actinic Lamp Spectral Quality. 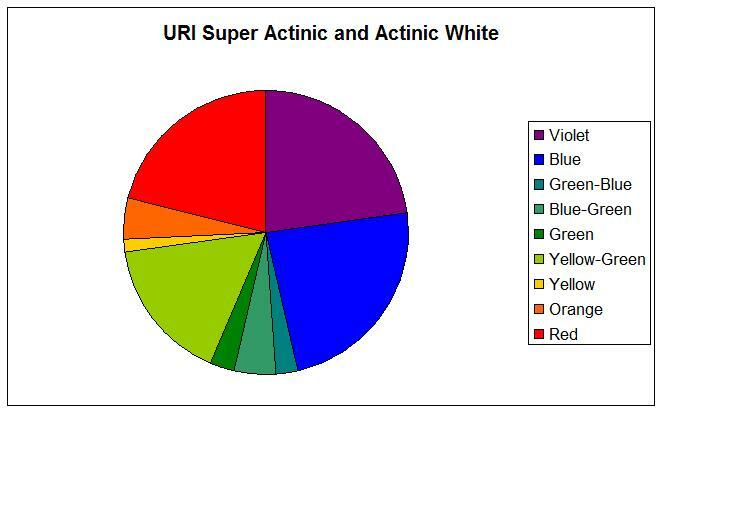 Figures 8 and 9: URI Actinic White Lamp Spectral Quality. 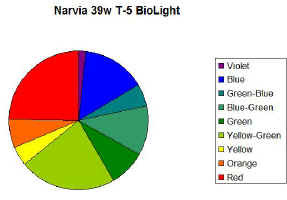 Two lamps – the Narvia Biolight and URI Actinic White – offer reasonable approximations of sunlight spectral quality. 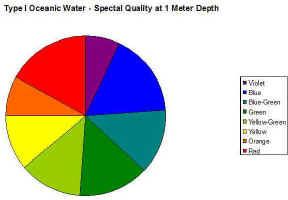 If an aquarium is especially deep (say, over 76 cm in depth), aquarium water with low APHA Color (“yellowness”) will naturally and selectively ‘filter’ light from these lamps and offer reasonably realistic representations of very shallow waters. The ATI ‘Aqua Blue’ lamp offers a reasonable rendition of 10 m deep oceanic water – which brings up the question – do we really wish to replicate the ‘blueness’ of deeper waters? Certainly, this is a personal choice, but I suspect that an aquarium illuminated by only ‘blue’ lamps will be the choice of few hobbyists. I tend to think that the majority of reef-keepers would prefer a ‘warmer’ look, one where color rendition is accented by the yellow, orange and red wavelengths of low-Kelvin fluorescent lamps. The question is not if we can imitate light-at-depth, but if we actually want to. 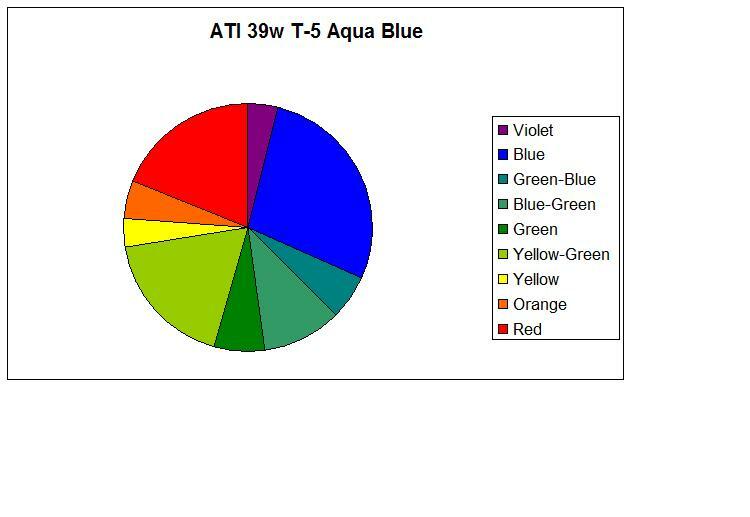 Unless the goal is to illustrate coral host tissue fluorescence through excitation with a predominance of violet/blue wavelengths, I suspect most display aquaria would be unnaturally ‘warm’ in appearance due to yellow-red wavelength generation by the majority of fluorescent lamps. 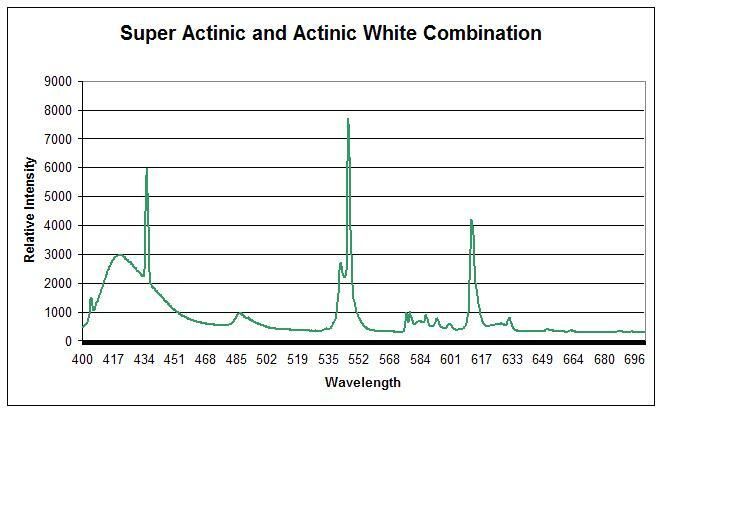 Discussion of spectral quality would be incomplete without at least a mention of light intensity. 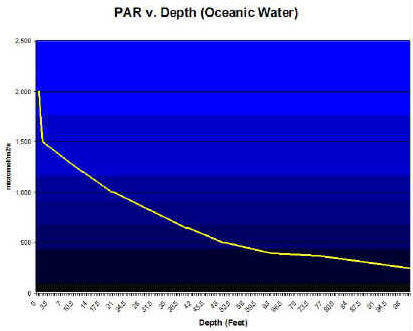 Figure 24 demonstrates PAR values at various depths of oceanic water (estimated to be Jerlov Oceanic Type I) off the west coast of the Big Island of Hawaii. 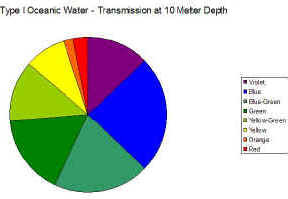 These measurements were taken at noon on a cloudless day, when water transparency (visibility) was excellent (easily exceeding 100 feet). 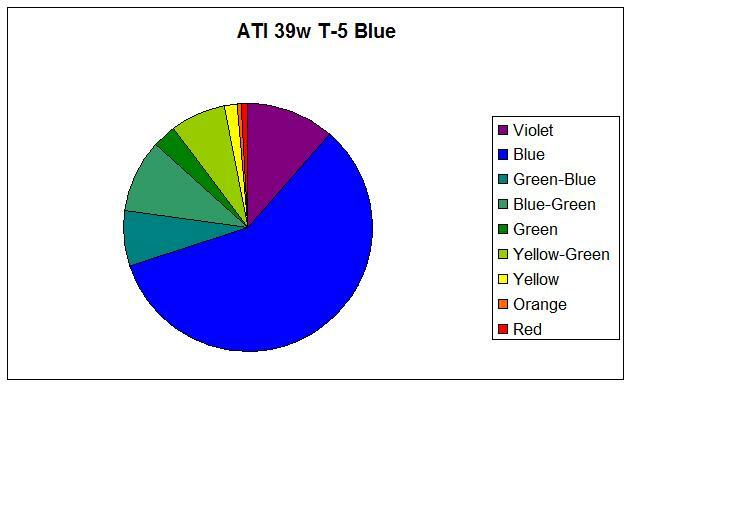 Many fluorescent lamps are available in ‘high’ and ‘very high’ outputs; T-5 lamps offer the advantage of small diameter, thus allowing a greater number of lamps within a given area (this also allows custom spectral quality through selective combination of lamps). 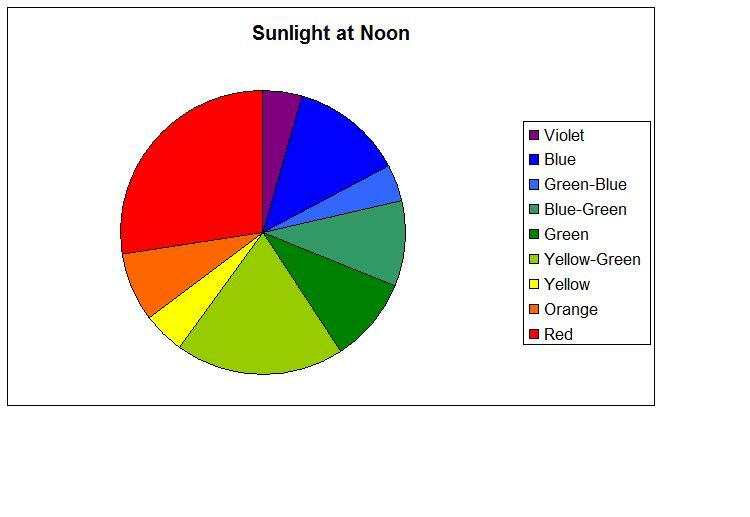 Reproducing natural light intensity is possible, but not probable, with fluorescent lamps. As one can see from Figure 23, light intensity is ~1,500 µmol·m2·sec (~75,000 lux) at a depth of 1 meter, and ~750 µmol·m2·sec (~37,500 lux) at 10 meters. 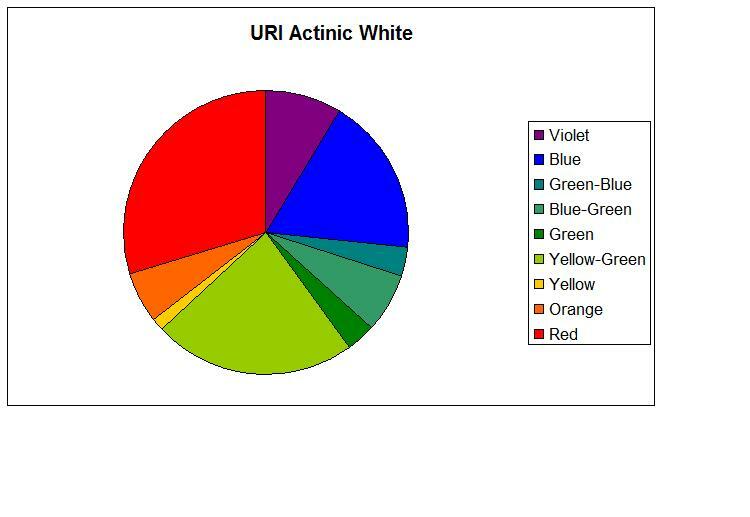 If replication of natural light intensity is impractical (in many cases), then one has to wonder why episodes of coral bleaching are noted under conditions of low-light intensity and natural temperatures. 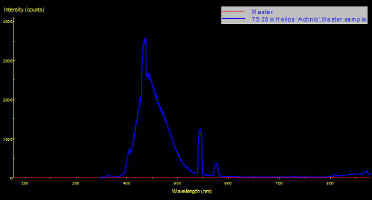 The answer seems to be linked with spectral quality, and associated imbalances of energy transfer between photosystems. This should be investigated further. 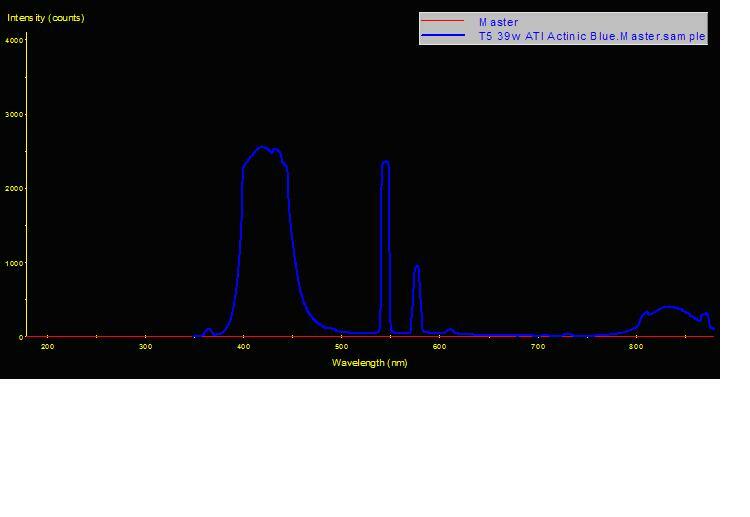 Of course, it is also apparent that light intensity plays an important role in photo-bleaching, and we perhaps we should establish acceptable light intensities at various red-to-blue ratios. This, too, bears more investigative work. Many thanks to Perry Jones of Sunlight Supply for supplying some of the fluorescent lamps. I.E.S. Lighting Handbook, 1984. Illum. Eng. Society, New York. Jerlov, N., 1976. Marine Optics. Elsevier Oceanography Series, Elsevier Sci. Publ. Co., New York. 231 pp.